In physical vapor deposition, a heat source is used to evaporate a metal or ceramic from a source material. These gaseous elemental or molecular species impinge and deposit onto your substrate. A form of physical vapor depositions in which a target anode is bombarded with an electron beam emitted by a charged tungsten filament under high vacuum. The electron beam stimulates the target to transform into the gaseous phase. The coatings utilized are yttria stabilized zirconia. Other rare earths can be developed. 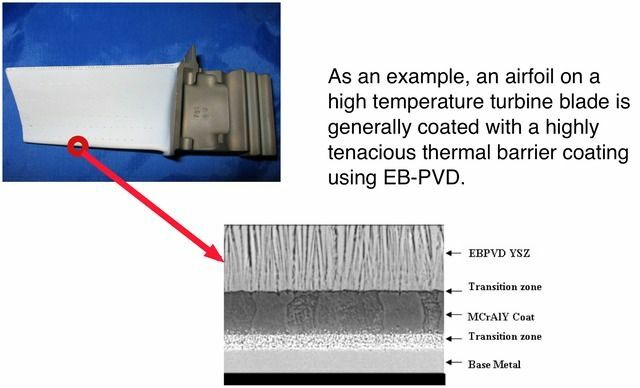 Coatings for wear and environmental resistance.